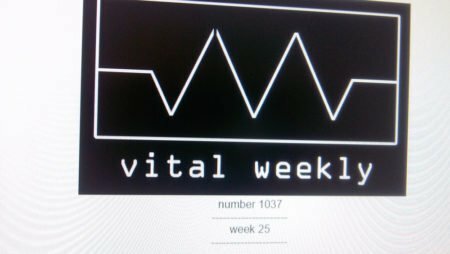 Review in Vital Weekly | Esc.rec. 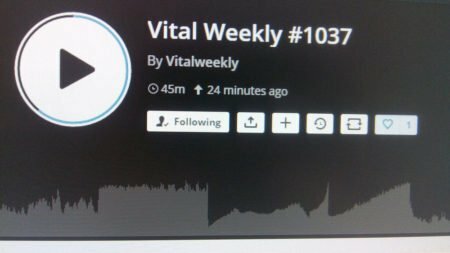 The collaborative effort of three labels from The Netherlands, of which two I might say are even from the sunny hometown of Vital Weekly, proving once more the creative power of such a small city. The cover has a fire burned pattern, something I didn’t encounter since O Yuki Conjugate’s ‘Equator’ CD and the silk screened inside cover glows nicely through these holes, which may or may not resemble a good old floppy disc. That has to do with the fact the group uses C++, a computer language used in the creation of the music. 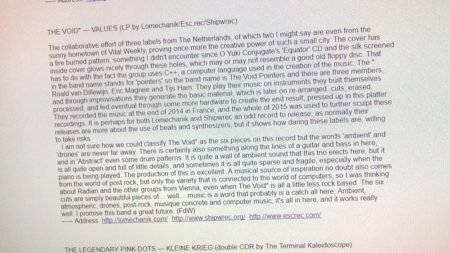 The * in the band name stands for ‘pointers’ so the band name is The Void Pointers and there are three members, Roald van Dillewijn, Eric Magnee and Tijs Ham. They play their music on instruments they built themselves and through improvisations they generate the basic material, which is later on re-arranged, cuts, erased, processed, and fed eventual through some more hardware to create the end result, pressed up in this platter. They recorded the music at the end of 2014 in France, and the whole of 2015 was used to further sculpt these recordings. It is perhaps for both Lomechanik and Shipwrec an odd record to release, as normally their releases are more about the use of beats and synthesizers, but it shows how daring these labels are, willing to take risks. I am not sure how we could classify The Void* as the six pieces on this record but the words ‘ambient’ and ‘drones’ are never far away. There is certainly also something along the lines of a guitar and bass in here, and in ‘Abstract’ even some drum patterns. It is quite a wall of ambient sound that this trio erects here, but it is all quite open and full of little details, and sometimes it is all quite sparse and fragile, especially when the piano is being played. The production of this is excellent. A musical source of inspiration no doubt also comes from the world of post rock, but only the variety that is connected to the world of computers, so I was thinking about Radian and the other groups from Vienna, even when The Void* is all a little less rock based. The six cuts are simply beautiful pieces of… well… music is a word that probably is a catch all here. Ambient, atmospheric, drones, post-rock, musique concrete and computer music; it’s all in here, and it works really well. I promise this band a great future.